A new report issued this spring by the Governor’s Highway Safety Association reveals there were more pedestrian deaths in 2015 compared with 2014 statistics. In 2015, 10 percent more pedestrians died due to motorcycle, truck and vehicle collisions. If you were injured in a motorcycle, truck or auto collision at no fault of your own, reach out to our truck accident attorneys in Tulsa at The Edwards Law Firm. Contact us today to get started. From 2009 to 2014, the number of pedestrian fatalities rose 19 percent, reflecting a surge from 4,109 deaths to 4,884 pedestrian deaths. Pedestrians now make up the largest share of traffic deaths in the last 25 years. Additionally, pedestrian deaths now account for 15 percent of total auto accident deaths, which steadily increased from 11 percent in 2007 to 15 percent in 2014. Last year’s numbers are projected to be the largest year-to-year increase since record-keeping began. The news is especially alarming given that the number of auto accident deaths has decreased in recent years thanks to new safety developments in vehicles. The report identified distracted driving and walking – when both pedestrians and drivers are glued to their cellphones – as a leading cause for the rise. There are also simply more people choosing to walk rather than drive due to the health benefits offered and the high price of vehicles and gas. Another leading cause of the rise in pedestrians deaths can be attributed to alcohol: 34 percent of pedestrians killed by vehicles had a blood alcohol content at or above the state limit, compared to 15 percent of drivers. The findings reveal a hostile environment for pedestrians on today’s roads. 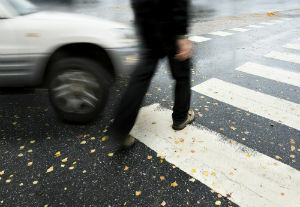 Many experts believe more can be done to ensure the safety of pedestrians. Government agencies, motorists and walkers themselves can all play a role in ensuring pedestrian safety. If you have injured or lost a loved one because of a negligent driver, contact experienced auto accident attorneys at Edwards Law Firm right away to discuss your legal claim in a free consultation. Call us today to schedule an appointment.